Unpublished essays by Peter von Bagh, Wu Ming 1, Emiliano Morreale, Roberto Chiesi. A conversation with Naum Kleiman, run by Bernard Eisenschitz. About Potëmkin: Léon Moussinac, Robert Desnos, Lewis Jacobs, Roland Barthes. 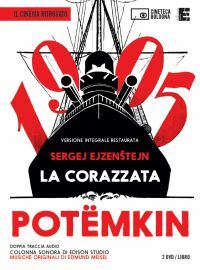 The music for Potëmkin: Lothar Prox and Helmut Imig about the original score by Edmund Meisel, and Giulio Latini about the electroacoustic soundtrack by Edison Studio.